We will take a short look at the concept of performance attribution. Imagine a fund that holds stocks in all sectors, except for the Oil & Basic Materials sectors. Even if the fund-manager was not very good at stock-picking in the remaining sectors, he would almost certainly have had a relatively good run these past 5 years, since these sectors have both lagged the broader market by a very wide margin. But by outright avoiding these sectors, he is also placing a large bet, since a jump in oil (and other materials) prices could quickly change his fortunes. There is always a possibility that this manager is really better than others at predicting oil and materials prices, but it seems more likely that he just got lucky. If he is indeed bad at picking individual stocks, the fund will start to underperform as soon as materials prices will stabilize. Therefore, investors should not only look at (relative) performance in itself, but also at the way in which it was obtained. However, how exactly can we separate the allocation from the selection effect? The general idea is to virtually split up a fund in two different funds: one active allocation and one active stock selection fund. The allocation fund can take active decisions on the group level (can overweigh sectors), but cannot take active intra-group decisions (cannot overweigh companies within the sector). For the selection fund, the opposite holds: this fund has to follow the benchmark group weights (adhere to the benchmark’s sector weightings), but it can take active intra-group decisions (for instance, overweigh BMW and underweigh Volkswagen w.r.t. the benchmark). Simply put, the allocation effect is the excess return of a ‘pure’ asset allocator compared to the benchmark, while the selection effect is the outperformance of a ‘pure’ stock picker over the benchmark. We have carried out a performance attribution for Vector Navigator, starting in January 2012. The benchmark (MSCI All Countries in EUR) had a return of 75% since then, while Navigator returned 107.1%. The difference – 32.1% - can be split up into an allocation effect of 3.5% and a selection effect of 28.6%. In other words, the vast majority of our market-edge over the past 4 years (about 90%) came from stock picking rather than from allocating our assets to the best performing sectors (about 10%). This should come as no surprise as we have always stated that we shy away from taking large sector (or other) bets, that can be very detrimental to an investors’ wealth when they fail. The analysis also reveals how our stock-picking alpha was distributed over different sectors. Our stock-selection process added most value in the Industrial, Healthcare and Consumer sectors (Cyclical and Defensive). On the other hand, we added practically no value in picking stocks in the Real Estate sector. We might just have well bought an ETF to cover this one. But overall, we can be pretty happy with these results, as in 10 out of 11 sectors we appear to have accumulated substantial active return for our investors. 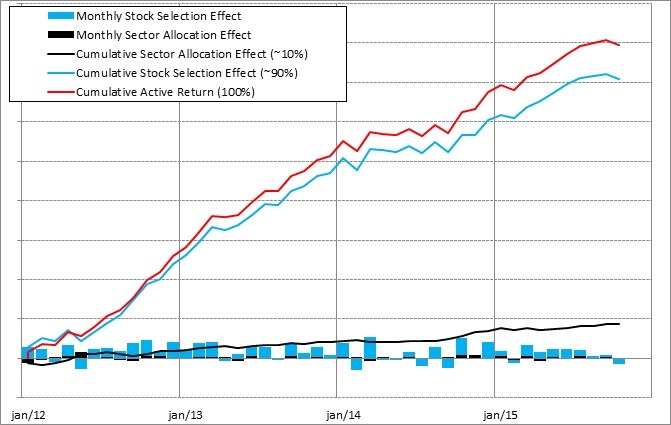 We can safely conclude that our outperformance was not driven by sector bets in the last 4 years– as is shown by the modest part allocation plays in our total active return. Moreover, our company bets seem to have worked out pretty well for all but the Real Estate sector – which again underlines the robustness of our model in the long-run.